Nowadays, many lack the awareness that design plays a significant role in bringing innovative solutions to our lives, including how improvements are made or the people behind these innovations. Between September 28 to October 8th, Design Exchange in partnership with the United Nations Development Programme created an expo called EDIT. This expo celebrates design excellences, as well as demonstrates how important and relevant design is to everyday life. EDIT looked to showcase five main themes and goals: nourish, shelter, care, educate and the message: prosperity for all. They created a playful and interactive environment through presentations of most innovative people, projects and ideas that are transforming our future. I was lucky enough to be a Participant for the 10-day immersive festival that celebrated design, innovations and technology. There were a lot of really influential technological designs and installations at the show and I would love to share the most memorable and inspirational. This Sci-Fi immersive room was probably my favorite of the show. As you entered the space, it really felt like it has a pulse of its own. As the LEDs slowly transitioned from on to off, it felt as if I was entering a living, breathing entity. 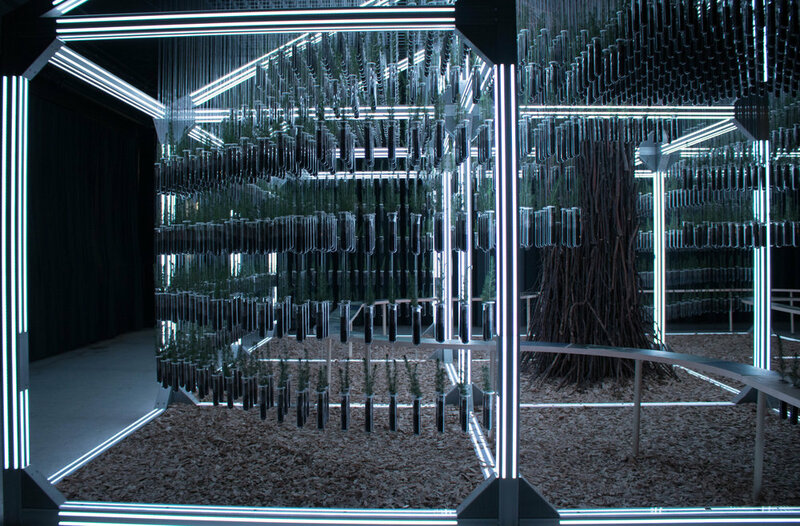 This installation,created by Great Gulf, was made from 5000 tree saplings planted in test tubes and suspended from the ceiling. Attendees walked through this maze and embraced the capabilities of wood as being a building material as well as a renewable property. Wood takes a fraction of energy to produce when compared to steel and concrete, as stated by Great Gulf. After the show, the Great Gulf will plant the 5000 saplings across Canada to promote the use of wood in building projects to utilize our natural resources. With influence by the old soap factory’s history, this installation really had its own eerie sensation as it luridly drifted within the interior. LeuWebb Projects is a Toronto based team of two. Each of the ‘ghosts’ were inflated by two industrial fans from underneath and illuminated by internal multi-coloured lights. 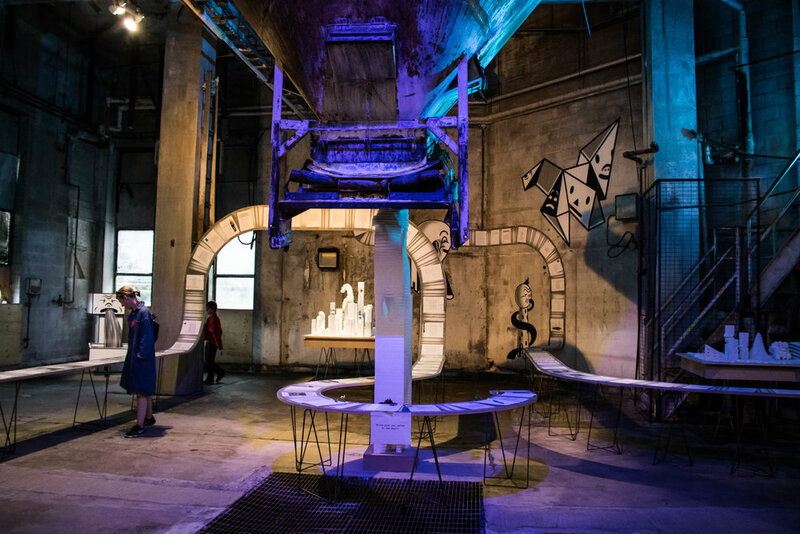 The two entities created a dialogue and reflection of kinetic space on the ‘ghosts’ of the manufacturing within our city. Studio Waldemeyer, based in London, UK, was inspired by one of the major themes of the show, Prosperity for All. Through the language of lights, they illustrated how economic policies impact society today. The multitude of levels and colours in lights represents the manipulating taxation on the low-income, middle-class and high-income households. The Equalizer allows us to interact with its LEDs through a touch screen to set different levels and heights shown on the LED rods themselves can be set, allowing us to ‘manipulate’ the rates of taxation for the 3 different incomes. This international exhibition displays commission letters by architects to public officials and developers who helped shape cities worldwide. Letters are displayed on wooden panels that are intertwined within the space, creating an astounding interactive sculpture that occupied the entire room. PARTISANS, partnered with Storefront for Art and Architecture, shows that with globalization and the adaptation of contemporary cities, the architect’s role is to answer questions that are asked. With the letters on display, it really allows you to read into the architects’ side of things. This exhibition proposes a new future for design and development for Toronto, which were presented to Mayor John Tory at EDIT’s opening night. Last but not least, the Cricket Shelter was designed and created by New York-based design studio Terreform ONE. They aimed to combine shelter and food. They found that a lot of the emergency shelters are only designed to provide protection. 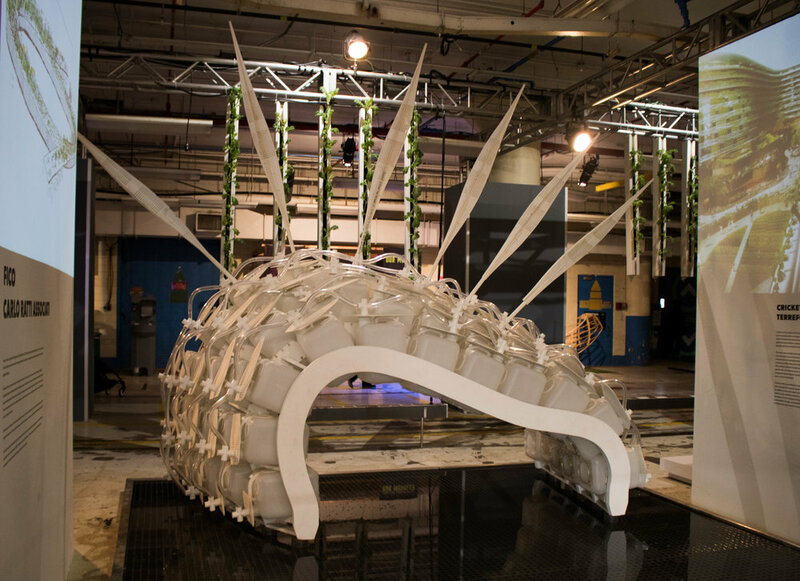 This modular structure contains 224 twenty-two-litre chambers that produces edible crickets. Eating insects themselves have been seen a lot more to help conserve meat productions and is becoming a new source of dietary protein. Built in the walls are pods that are used for breeding, including seven birthing pods where females lay their eggs. After hatching, the crickets move through tubes into a mesh-lined living habitat where they grow until harvest. The shelter is able to produce approximately 50,000 crickets in six weeks. Did I mention that there was a lot of cricket-esque food there? I indulged in some cricket ice cream and cricket bolognese...It still makes me shiver at the thought...It was an interesting taste. Overall, it was truly amazing to see designers all over the world with different backgrounds come together to present topics within our society that they were passionate about. Whether they had an artistic, architectural or engineering background, everyone brought to light pressing social issues that need change through their inspirational work. . Whether it was the space they were creating an installation for or combating an economic problem, everything has purpose and it all made us question our future. Cheers to an unforgettable show!